ULTRA LIGHT - ULTRA FAST - MADE FOR SPEED! 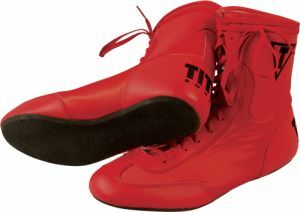 Full synthetic leather upper with tight weave nylon fill sits atop sculpted polyurethane soles designed exclusively for boxing. Built for quick footwork and speed. Beautiful embroidery complements any style. Approximate 6" height is ideal.